I logged into one of my customer’s Google Local Business Centers today and had a pleasant surprise. As you can see on the image, Google has finally addressed the problem of businesses that service customers outside of their immediate area. Until now, my customers with lawn services, out-call massage, and plumbing businesses had major issues coming up on the map outside of their immediate metropolitan areas. Today they enabled the “Service Areas and Location Settings” area in the Local Business Center. Businesses have the option of choosing whether their customers come to their business location or if they serve customers at their address. They have the option of showing their address or not and they can choose which area they service. The service area can be chosen as a radius from their address, or they can put in geo-modifiers such as zip code, city name, or even county name. I used both methods for several of my customers, choosing a radius or choosing counties or cities as appropriate. It’s too soon to determine how this new option will affect rankings or if hiding your address has a positive or negative affect on listings. 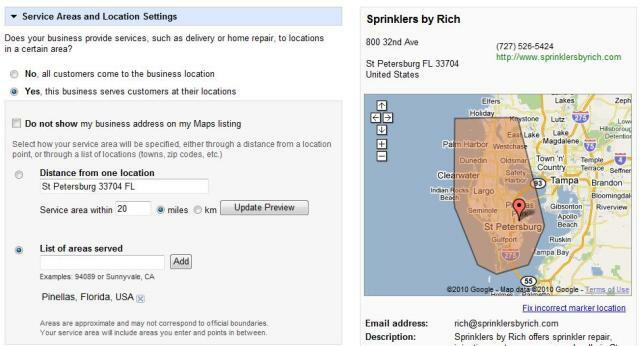 This literally changes how I advise my customers in their local search efforts. I’ll let you know my results as time goes on. The bottom line? Google is mapping the planet one place at a time and providing it for us in Place Pages. The information gathered in different ways, is enhanced, in typical Google fashion, by users around the globe making it more human, more useful. Can SMBs benefit? A Google SVP recently spoke about Maps and noted: “Everything is finally in place to enable small businesses to connect with customers online”. These technologies and the competitive implications of Google’s moves to map everything including local businesses means that if you are not using the internet to YOUR business’ full advantage today, you are simply missing out. FREE ADVICE if you haven’t claimed your Google local business listing already: watch this two minute video brought to you by Google to learn how. IT IS FREE! Today in the US alone, there are almost 1billion searches with local intent from consumers which are ready to buy a product or service. Searches are getting longer, more granular. Down to the city or zip code, niche service, brand, model, or whatever your company sells. Furthermore, geospatial information is the building block for the whole next generation of user experience from smart phones to virtual reality. More reason to do something now if you want to take advantage of emerging opportunities. It is not when you are going to do something for your business to BE FOUND…it is a matter of when. We believe your business is #1 and businesslocallistings.com is 100% effective in getting it there. Visit our FAQs tab and I will show you how to get your local listing to the #1 spot. Our pricing (see Packages tab) is yet another reason why your business local listing can’t wait. Call me for a free consultation about how to make your business local listing #1…especially when a user queries for that specific brand you carry or any product or service you offer. Get your SMB on the map today! Official Google Blog: Place Pages for Google Maps: There are places we remember! I’m in Google Maps every day as a part of my job promoting the hell out of Local Search and I came across an interesting change in Google Maps. When you click on “more info” from Google Maps, but not yet from the Google 10-pack, you get a different, more expanded version of the Local Listing. That’s a screenshot of my own listing there on the right. I really like the new layout, let’s see if they roll it out to all the local listings, or if it stays strictly on Google Maps. Update: So I just found an article, and posted a link, identifying these as Google Place Pages. The official blog states that one exists for every spot on the map! Microsoft launched their new search engine Bing last week. My first impression? It’s visually stunning and looks to give Google some real competition. I’m doing some research into it, focusing of course on how it’s going to play in the local search industry. My focus has mainly been Google and Yahoo, but it looks like I’m going to have to pay attention to Bing as well! I’ll have a more detailed report for you once I’ve done some more research. So I spent an exciting Saturday night researching new methods for optimizing local search and found a site that gives you a local search ranking! Very exciting stuff for someone who makes his living in local search. Getlisted.org has a simple interface that allows you to enter in your business name and your zip code. So I only have a 45% ranking because, although I’ve done my Google listing, I haven’t yet sat down to do my Yahoo, MSN Live, or Best of the Web listings. It’ll come as no surprise to a lot of business owners that I neglect my own company to take care of my customers. You can even drill down further to see exactly what you need to do to increase your ranking, from adding photos to getting citations on other websites to getting reviews. All things that, coincidentally, I can help you with. Surprisingly, there’s no mention of video, and I can’t stress the importance of video enough. So how do you rank? If you’re not happy, I can help you out with it!